This morning I was racing to my day job and didn’t have time to make my usual protein shake. 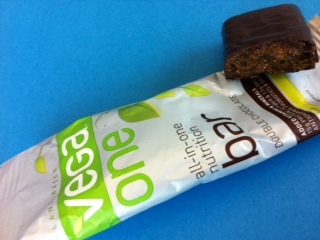 I grabbed some fruit and while racing out the door also grabbed from my stack of bars a Vega One all-in-one nutrition bar. I have previously posted my detest of bars, but I didn’t hesitate excited to try the Double Chocolate and assuming it would taste as delicious as the others, and of course, it did! The bars are vegan which is great news for many of my friends. I ate the bar during my first meeting this morning and shared with my coworker who is gluten free – so is the bar. At first she was taken back by the 250 calories, but then was totally shocked by the 15grams of protein. For me, I’m willing to add on those little extra calories for all that extra protein.